Motion sensors are the nervous system of a smart home. They can monitor doors and windows. They can relay a message to a light switch to turn on a lamp. They can trigger a connected video camera to start recording. They can send an SMS message alerting you that someone is in your home when it should be vacant. They can even inform your thermostat of a temporary change in your usual away-from-home schedule. But to be useful, motion sensors need to be installed in the right places. So the D-Link DCH-S150’s reliance on Wi-Fi, versus low-power wireless protocols such as ZigBee or Z-Wave, renders it supremely unpractical. Wi-Fi gobbles up too much power for battery-powered devices, so the DCH-S150’s dependence on Wi-Fi means it must in turn depend on an AC outlet. D-Link's motion sensor is most useful when paired with other products in D-Link's Connected Home ecosystem. First, most homes don’t have enough AC outlets, particularly in foyers and hallways where you’d want to monitor a door (a fact you’re probably reminded of each time you plug in your vacuum cleaner). Second, you can’t use an AC outlet that’s controlled by a wall switch, because it might get turned off. Third, the vast majority of a home’s electrical outlets are about 12 inches above the floor. Got pets moving inside your house? A motion sensor that close to the floor is pretty much useless because it will be triggered constantly. Still interested? The DCH-S150 is very easy to install. Simply plug it in, push the WPS button, push the WPS button on your router, and it should pair (assuming the sensor is in range of your Wi-Fi network, of course). An LED glows solid green once the connection is established. 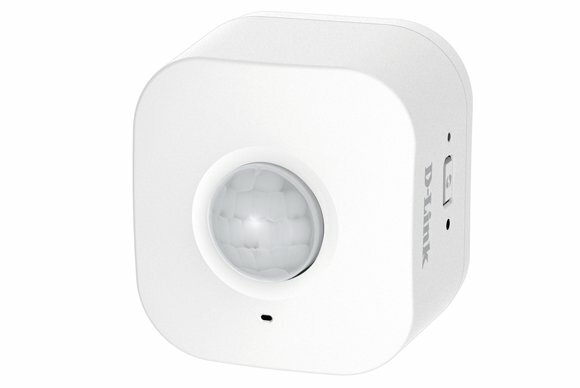 D-Link rates the passive infrared sensor as being capable of detecting motion up to 26 feet away. 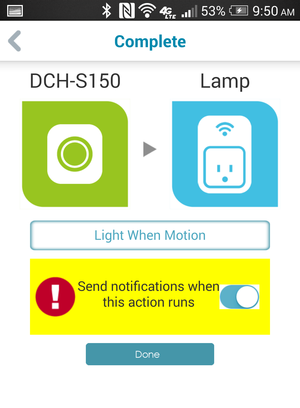 To configure the motion sensor, you’ll need to download and install D-Link’s mydlink Home app (available for Android and iOS smartphones and tablets) and sign up for a free mydlink account (or add this device to your account if you already have one). You’ll need one of those devices to do anything useful with the motion sensor, because you can’t do anything with it from D-Link’s web portal. Read my reviews of D-Link’s DCS-933L IP camera, DSP-W215 Wi-Fi Smart Plug, and its Connected Home Platform in general to gain a full understanding of how these devices operate together. The DCS-S150's dependence on Wi-Fi and AC power severely limits its usefulness, but it's inexpensive and has some utility when paired with D-Link's DSP-W215 Wi-Fi Smart Plug.